We know you have been waiting patiently for better images of new mum Astrid and her beautiful baby daughter, Atsuko. The wait is over. Anna Marzec, our Post-Release Monitoring Coordinator in Batikap recently sent us not still images, but a short video capturing tender moments of Astrid and baby Atsuko! Astrid is a fantastic mum and her baby girl is getting bigger every week. Vet Meryl Yemima who just returned from Batikap a couple of weeks ago also reported that Astrid was once seen making a pillow and a blanket from leaves, for her baby daughter to sleep at night. 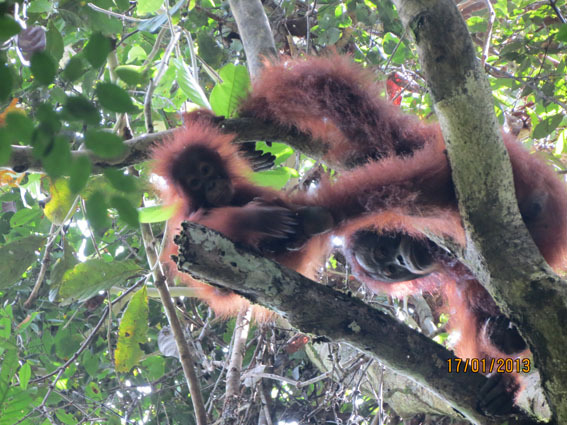 The other longest residents of Batikap forest are doing great too. 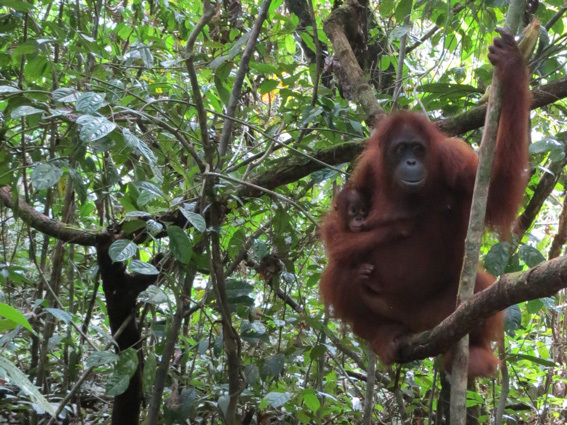 On previous updates, we reported that after Astrid gave birth, Tarzan had been on the watch. Like a responsible dad, he guarded Astrid and Atsuko, and for the first few weeks did not allow anyone to come close, including Astrid’s longest and closest friend, Monic. He chased Monic away as she tried to visit Astrid. Well, guess what? Monic and Tarzan made up and for the past 3 weeks have been inseparable! In the following video, Tarzan and Monic are spotted feeding not very far from each other in neighbouring trees. Tarzan is eating liana fruits, while Monic is in the mood for protein and enjoying some termites. Last but certainly not least, here are short updates on the rest of the Batikap forest’s residents. Last month wasn’t easy but we had quite a few good days with great results in radio-tracking with up to 14 orangutans signals recorded at once, but also many unexpected visual observations. We have seen Jamiat, who used to hide from us and had initially travelled far from his original release location, on the same tree with Gundul. We saw Sempung and Giant, but also Mama Ebol whom we had not been able to find for quite some time. Mama Ebol looked very healthy and had even gained some weight. Young Ebol found a spot in the forest with many of his favourite foods and thus stayed there for a while, feasting all by himself. Even Ika who was gone for almost the entire month was finally found and observed this week. Vet Meryl even saw Ika fishing for ants with a stick. Sif was seen a few times with her daughter Sifa, but for some reason she disappeared each time on the next day when we hoped to follow her again. We think that this is her strategy. She is the smart one and pretends that she doesn’t mind our presence but as soon as we are gone she travels far enough so we can’t find her the next day. Other orangutans usually kiss-squeak or throw branches in order to scare us or simply hide. But Sif, Sif is playing us. Gadis and Garu were also spotted hanging out and feeding in a tree. We are happy to report that all our orangutans are doing very well even though most of them are clearly not happy to see us as they have become more and more wild every day. 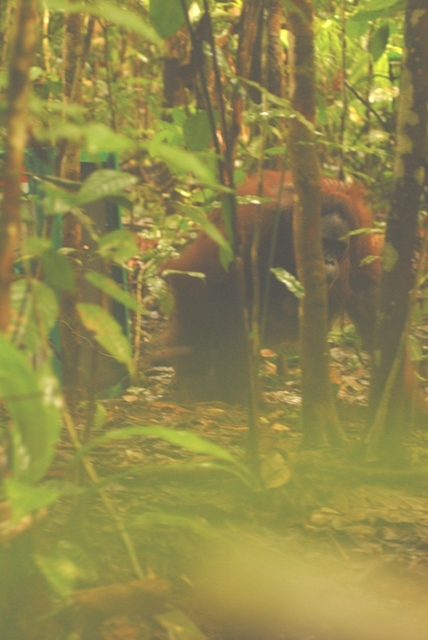 Our monitoring team is out there in the forest tracking and observing released orangutans on a daily basis. Some of the individuals can only be recorded with radio-tracking because they are so far. Every month, we have a number of orangutans targeted for visual observation. But orangutans are not aware of our plans and schedules thus they are often not found in expected location. So even individuals who have established their home range near release sites cannot always be seen and followed regularly. As we have just welcomed newly released orangutans last week, a lot more monitoring to be done now that we have a total of 64 orangutans roaming the forest! We’ll keep you posted. In preparation for our fifth orangutan release into Bukit Batikap Conservation Forest, a team consisting of highly experienced technicians from Nyaru Menteng, our own HLO (Helicopter Landing Officer) trained personnel, and our media/ documentation team departed from Nyaru Menteng to join the release and monitoring team who are based fulltime at Totat Jalu Camp in Bukit Batikap. 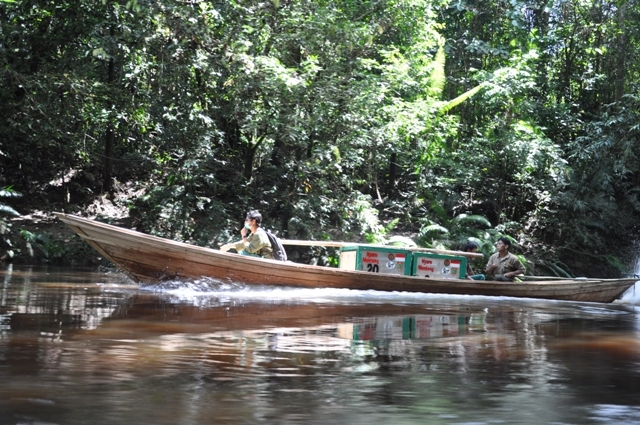 Reaching our camp in Batikap takes between two to three days, depending on the weather, using cars and boats. The team left Palangka Raya at midday on the 9th of February and stayed overnight at Camp Menyalap in Dirung village after a journey of almost 12 hours by car. Early the next morning the journey continued by speedboat for 3 hours to Camp B, a small transit camp for coalmining workers. From Camp B, the team proceeded using ces (kelotok-boat) for another 4 hours to Tumbang Naan, a small village close to Batikap, where they rested for the second night. On day three the journey continued from Tumbang Naan, another 3 hours by ces to Tumbang Tohan. From here the last leg of the trip is a 3 hour ces ride to Totat Jalu Camp. 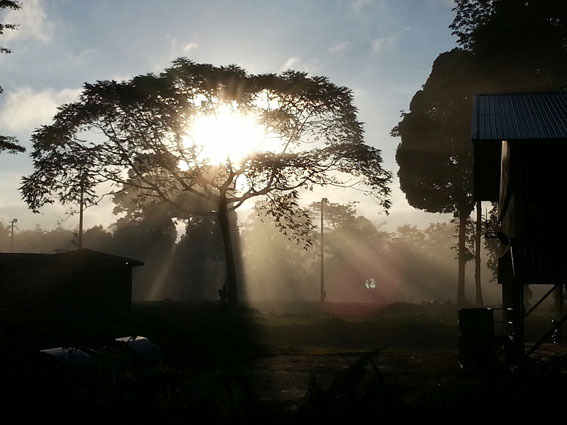 The team finally arrived at camp at around 8 pm on February 11th. The release preparations in the field start several days before each event and two days before the orangutans were due to arrive, the team re-checked the condition at the actual release points to ensure access on the day. Four release points had been prepared for a total 20 orangutans; four individuals were planned to be released in the forest just behind the camp (close to the helipad), another six (2 mother and infant units and two females) along the Joloi River, and the remaining 10 (two mother and infant units plus others) to be released at two points along the Teneng River. 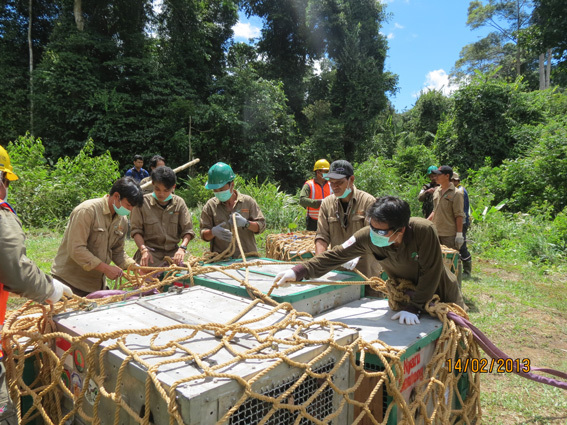 The day before the first orangutans were due to arrive, the release team conducted a simulation at camp to test equipment and final practice for the transport cage carriers. The team also cleared the helipad to remove any possible debris which could potentially be a danger if caught up by the wind generated by the arrival of the helicopter. The morning of the first day of the scheduled release, when everyone was busy with final preparations, we had a special guest arrive. Tarzan, the dominant male orangutan who was released back in February 2012, visited us at the camp! He made hispresence known through several long calls before finally showing up and tucking in to the fruits at the back of the camp. 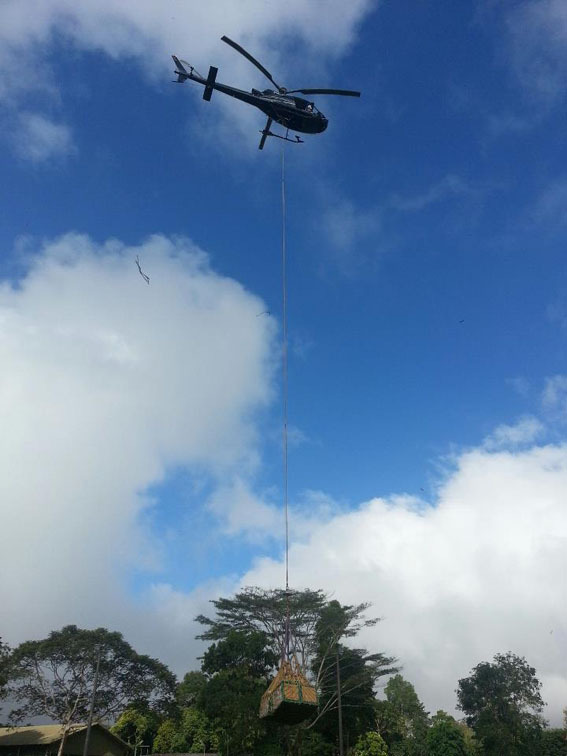 The first load of orangutans were transported by Squirrel helicopter in a sling-load at 9 am. They were Darsi, Edwan, Rahmat, and Klowor and all were released at the point behind Totat Jalu Camp on the bank of Posu River. 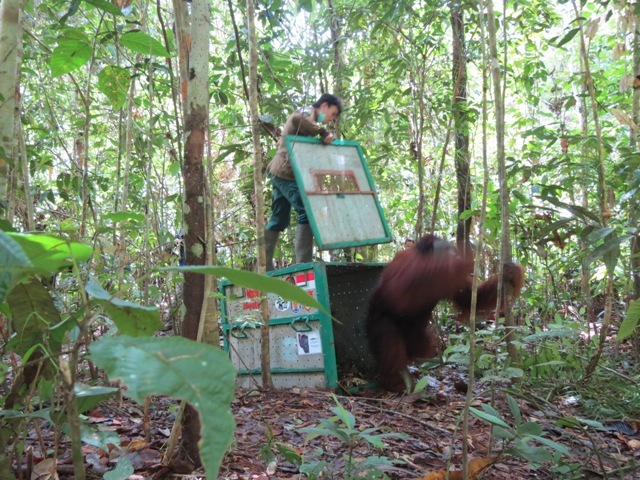 Darsi, the lucky number one, was released earlier than the others as we hoped that as the only female, the other three orangutans which were males, would follow her into the forest instead of wandering around the release point. Following Darsi were Edwan, Rahmat, and Klowor’s turn to be released. 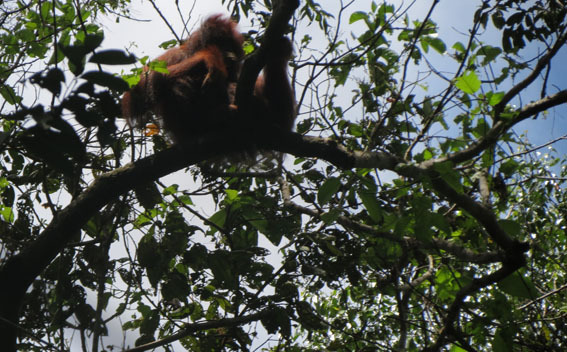 As the transport cage was opened, Darsi who we thought was still possibly a little drowsy from the sedative, climbed straight up the tree in front of her. She didn’t hesitate at all as she climbed up to the top of the tree. She rested once in a while and made several nests to nap. Late in the afternoon, she tried to make a good nest for the night but Rahmat kept following her, so she ended up making five nests until Rahmat finally gave up bothering her! Klowor had already begun eating the food in his transport cage before we deemed him fit and recovered from sedation, hence he was next for release. Edwan was next and went straight up the nearest tree as soon as the door of the transport cage was opened. According to the monitoring team who followed him, he went on to eat termites which he found nesting in some tree bark, and at 10.30am he made nest and rested for about an hour. He finally made his night nest not far from his release point at around 5pm. He actually spent most of the day with Klowor until they finally separated at 4.30pm when Klowor decided to explore further into the forest. They didn’t seem annoyed or intimidated much by Tarzan’s long calls. The second helicopter trip brought Lupita, Manggo, Centil and her baby Ross, and Markisa and her baby Uli. These orangutans were released at a point by the Joloi River. 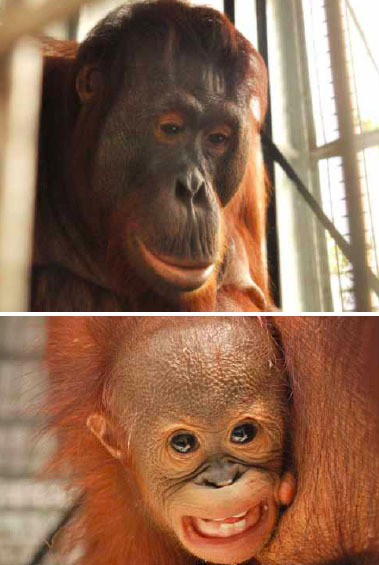 Centil and Ross were released first, followed by Markisa and Uli, Manggo –who is Markisa’s first child-, and Lupita. It was an interesting moment to see Centil when the transport cage was finally opened. She stepped outside carrying Ross, took a look around, and went back in to get a corn on the cob! With the corn safely in her hand, she climbed onto a liana and rested while enjoying the corn. She didn’t go very far from her release point, hence the monitoring team who were assigned to follow her didn’t really have to walk far! She enjoyed Ficus sp.or Lunuk fruit around the release point and her eyes never left Ross who ventured by herself not far from her mother. Once in a while Centil would also watch us and they finally made a nest at 5 pm around 50m from the release point. 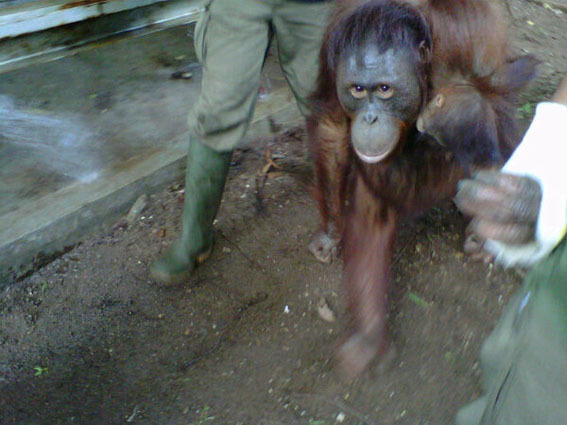 Markisa and Uli stayed together with Manggo after being released. Uli played with Manggo while Markisa enjoyed fruit around her. Lupita travelled pretty far from the release point, even though she was still recovering from the trip. She didn’t climb right away, instead she walked on the ground and hung around for a while on a low hanging liana. When she finally went into the forest, we were surprised by her pig-like sound, indicating that she was angry. Apparently a squirrel surprised her! She tried to hit the squirrel but missed and the squirrel ran away. Not long after, she made pig-like sound again. This time she seemed to have been surprised by a passing Hornbill. Lupita really needs to learn that the forest is full of other creatures. Unfriendly weather conditions yesterday kept Mexa, James, Alibaba, and Danur from getting back to their new home in Bukit Batikap Conservation Forest. Unfortunately this meant that they had to stay another night in our transit enclosures at PT Indo Muro Kencana (IMK) and could only be flown today once the helicopter pilot deemed the conditions to be safe. This morning there was good news from our team in Bukit Batikap, reporting that weather conditions in Bukit Batikap were very bright and clear. The Medical Team began preparing at 6.30 am. Our veterinarians, Agus Fahroni and Riani Anggun Mumpuni, sedated four adult orangutans so that the team could safely move them into travel cages ready for their journey. 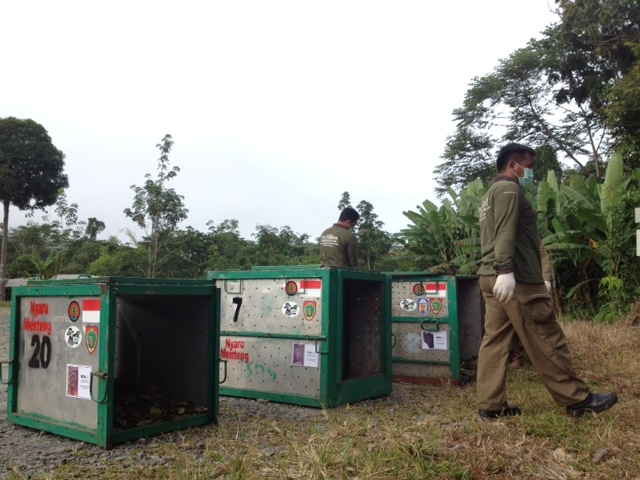 Today is the last departure for our orangutan release candidates within this event. These four orangutans have lived on our Pre-release islands for several years learning all the necessary skills they need to return to the forest. The Medical Team and technicians are very careful and meticulous in moving the orangutans into the travel cages, ensuring the safety of all team members on duty and of course the orangutans. 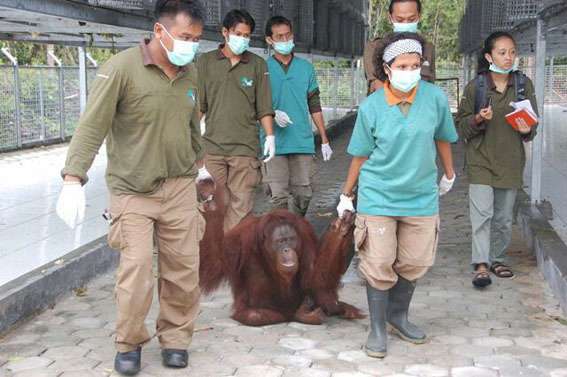 Mexa, the only female orangutan in this last group, was the first orangutan sedated. Alibaba, Danur, and James followed Mexa then all were easily moved from transit enclosures to travel cages. 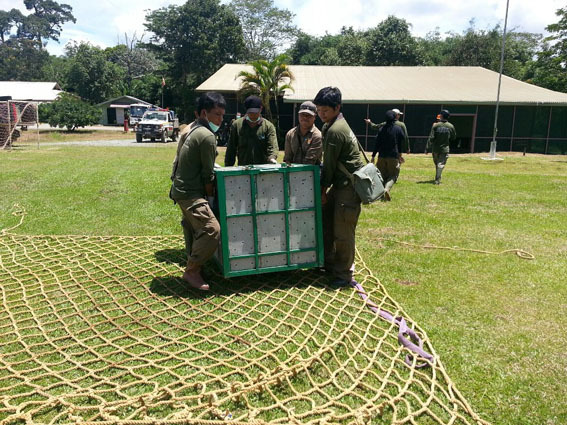 The four travel cages containing the beautiful Mexa and three adult male orangutans were then secured safely within the sling net and were ready to be flown by Squirrel helicopter to Bukit Batikap. Weather conditions were good and at 9 am the helicopter took off, leaving the IMK helipad to deliver Mexa, James, Alibaba, and Danur to Bukit Batikap. Mexa, James, Alibaba and Danur’s journey from Puruk Cahu to Bukit Batikap took place smoothly and according to the schedule, within 45 minutes they landed safely in Bukit Batikap. The team in charge of transportation readily removed the four travel cages from the net and transported them to the release point determined earlier. 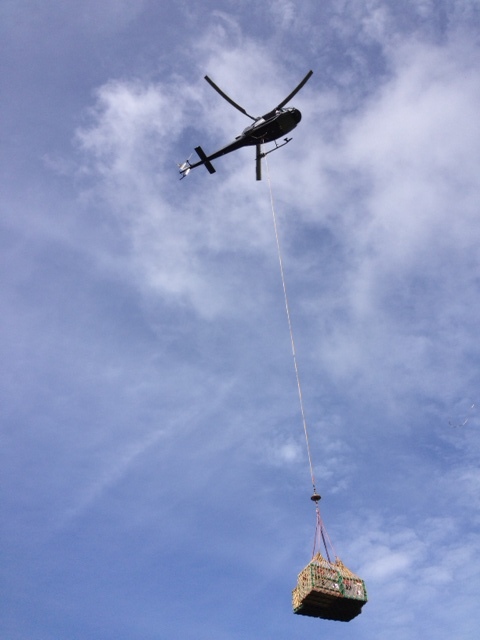 At 10.45 am, the helicopter returning from Bukit Batikap carrying four empty travel cages and of course good news that Mexa, James, Alibaba, and Danur were now living in their true home. Our team in Bukit Batikap reported Mexa and her friends were excited and ran directly into the forest after their cages were opened. Alibaba has become an active orangutan, being aggressive towards Danur when they met. Danur, who has a body size larger than Alibaba, went out of the way to avoid him. Forest life has begun! Welcome to your new home Mexa, James, Alibaba, and Danur! Please wait for the next story from our team in Bukit Batikap and catch up on all the excitement of the twenty orangutans who are now living in their new home! Yesterday, on Valentine’s Day, 10 orangutans have returned to their true home in the forest of Bukit Batikap. Today, after spending two nights in the transit enclosures at PT Indo Muro Kencana (IMK), the remaining 10 orangutans namely Lesta & Lewis, Dagoy & Debby, Mogok, Isis, Mexa, James, Alibaba and Danur would finally join their friends. Just like yesterday, the release candidates were divided into two groups. Two mother-child pairs Lesta & Lewis and Dagoy & Debby, a male orangutan named Mogok and a female, Isis, were put in Group 1. The rest were in group 2 which consisted of three males, James, Alibaba and Danur, as well as the only female orangutan in the group, Mexa. Group 2 would be released in the afternoon. As usual, the Medical Team, veterinarians Agus Fahroni and Riani Anggun Mumpuni, began preparing sedation doses for the first group of orangutans at 6.30 AM. Lesta, Dagoy and Mogok were all sedated and transferred into their travel cages. Lesta’s and Dagoy’s babies, Lewis and Debby, did not have to be sedated not only because they are still too young, they will simply follow their mothers wherever they go, including into the travel cages. Among the young adults in this group, only Isis who was not sedated as she strolled leisurely to her travel cage, guided by our technicians. Unfortunately, today’s activity did not run as smoothly as the previous day. The weather was not on our side. 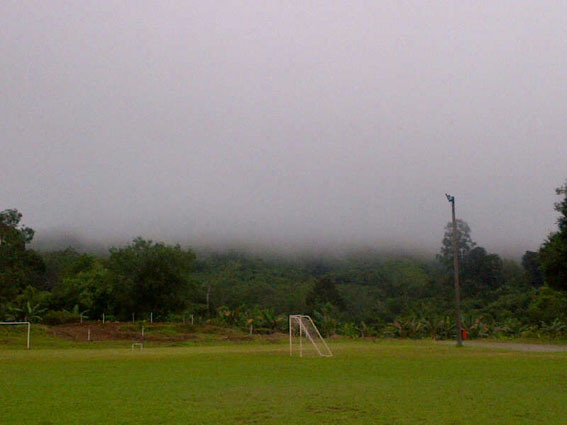 It was raining heavily in Batikap. While in Puruk Cahu, the sky was dark and the fog was so thick that visibility was very limited. 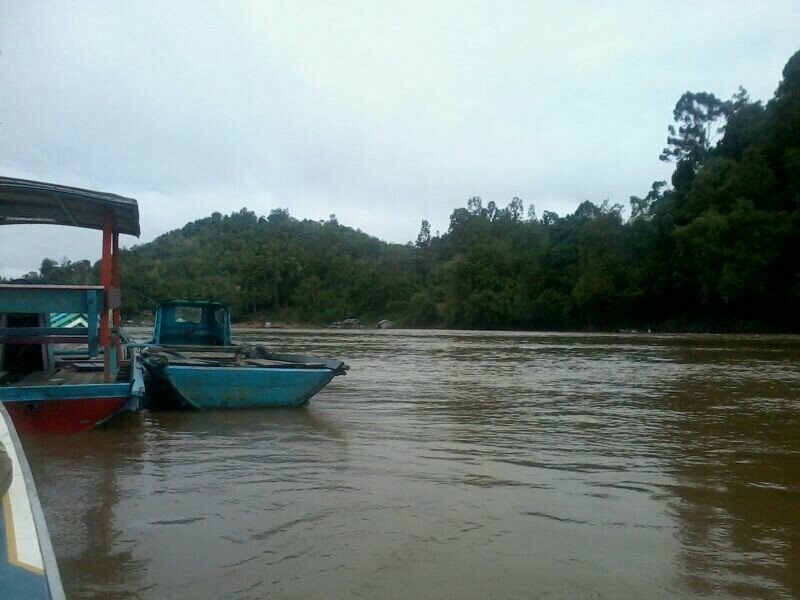 Our team in Batikap continued to report weather condition to the team in Puruk Cahu. We couldn’t fly in that condition and had to wait for the weather to improve. Lesta & Lewis, Dagoy & Debby, Mogok and Isis who were originally planned to fly at 9 AM finally took off from Puruk Cahu at 11.30 AM. Although the weather was not so encouraging, ultimately our friends Lesta & Lewis, Dagoy & Debby, Mogok and Isis arrived safely in their rightful forest home. They all have been released and now are enjoying their first night as free and independent orangutans. Congratulations, Lesta & Lewis, Dagoy & Debby, Mogok and Isis! 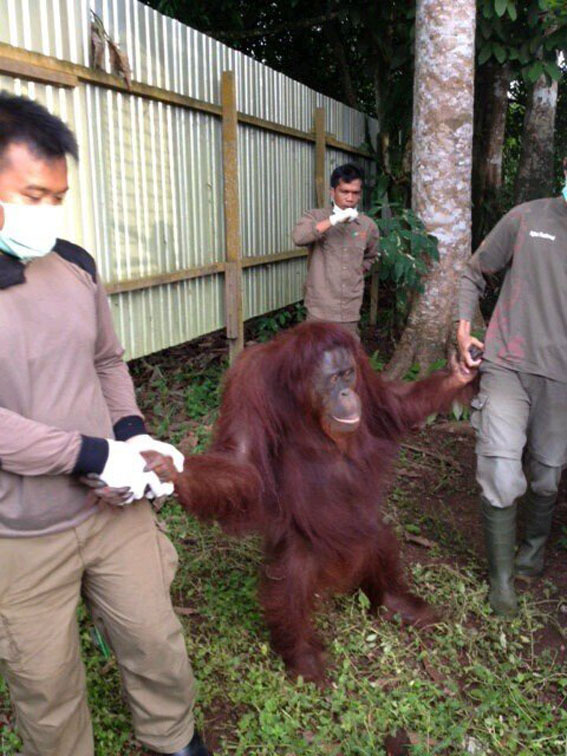 While waiting for the helicopter to return to Puruk Cahu, the Medical Team started sedating the second group of orangutans, which are Mexa, James, Alibaba and Danur. These are adult orangutans with big postures. We had purposely planned to release them last so the younger and smaller orangutans could have plenty of time to adapt and establish each of their “favorite areas” before the bigger and more dominant orangutans came to join them. The helicopter landed back at IMK helipad at 2.30 PM. Meanwhile, the team in Puruk Cahu was still communicating with the team in Batikap about current weather conditions. According to our friends in Batikap, the rain had stopped there. But in Puruk Cahu, it was just the opposite as rain started to pour. The helicopter pilot also reported that although the sky over Batikap was clearing up, it was not the case for the surrounding areas en route to Batikap, making it very dangerous to fly. Finally, at 3.15 PM, we decided to cancel the departure of Mexa, James, Alibaba and Danur. 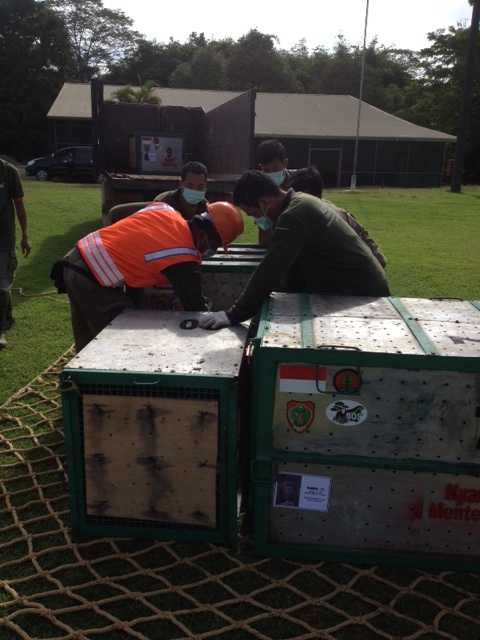 They have to stay another night in the transit enclosures at IMK and will be flown to Batikap tomorrow. We are hoping for friendlier weather tomorrow so release activity can resume and Mexa, James, Alibaba and Danur will be able to join their friends in the conservation forest of Bukit Batikap. We’re crossing our fingers. Happy Valentine’s Day, orangutan friends! Today, on February 14, 2013, we have released 10 orangutans in the conservation forest of Bukit Batikap. Here is a little love story from our team on the field. After staying overnight at the transit enclosure at PT. 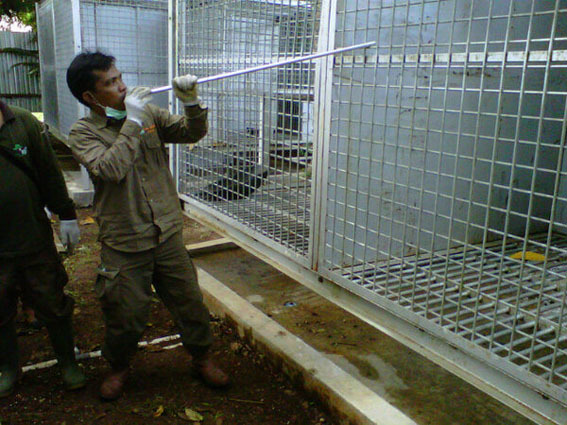 Indo Muro Kencana (IMK), on this loving day, the second day of Nyaru Menteng orangutan release activity began. Today, Edwan, Klowor, Rachmad, Darsi, Centil & Ross, Markisa & Uli, Manggo and Lupita were on their final homebound journey. While the rest, Lesta & Lewis, Dagoy & Debby, Mogok, Isis, Mexa, James, Alibaba and Danur will get their turn tomorrow on February 15. Today’s orangutan release candidates were divided into two groups. Edwan, Klowor, Rachmad and Darsi were the first to go. Our Medical Team – vet Agus Fahroni and vet Riani Anggun Mumpuni – started sedation process at 6.30 AM on this first group of orangutans, after which they were moved to their travel cages and taken by truck to the helipad at IMK. At IMK, sling load net was set up and all the travel cages were loaded and secured. Around 8 AM, the Squirrel helicopter took off, bringing Edwan, Klowor, Rachmad and Darsi to their new home in Bukit Batikap. We are so grateful that the sky was clear, bright and sunny, both in Puruk Cahu and in the forest of Batikap, allowing our orangutans to fly home on schedule. While waiting for the helicopter to return to Puruk Cahu, the Medical Team started sedation process for the second group, consisting of two mother-child pairs Centil and Ross, and Markisa and Uli, as well as two other females Lupita and Manggo. 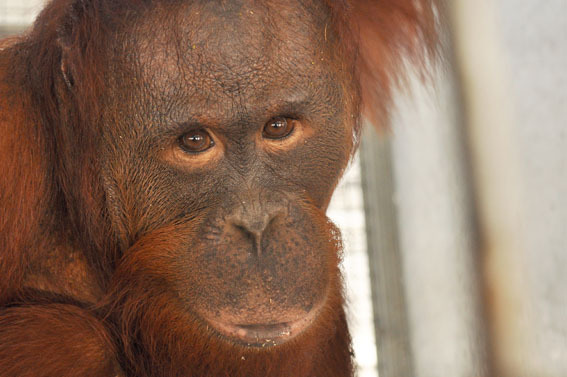 Manggo is also Markisa’s daughter who is now an independent teenager. Just like yesterday, Markisa did not have to be sedated. 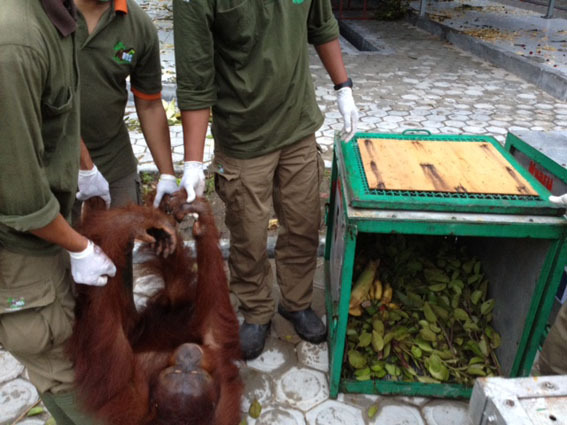 She calmly took the technicians’ hands and let them guide her and her daughter Uli to their travel cage. Lupita, too, walked hand-in-hand with technicians to her travel cage, without sedation. While Centil and Manggo were transferred into their travel cages after they both fell asleep after sedation. 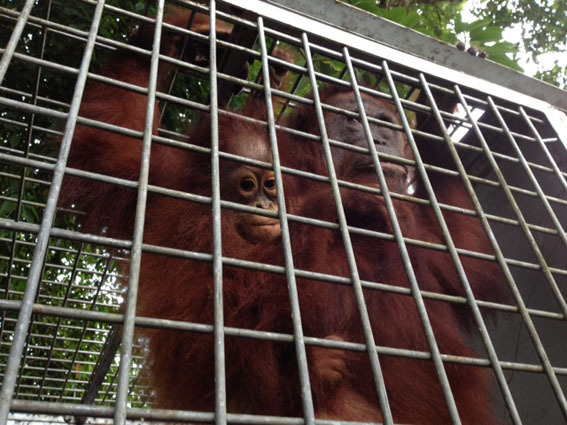 Centil of course shared her travel cage with her daughter Ross. As the team in Puruk Cahu was busy preparing the sling load for the second group, great news came from Batikap via satellite phone. Edwan, Klowor, Rachmad and Darsi had been released. They immediately climbed the trees as soon as their cages were opened and were happily playing high in the forest canopy. Such a heartwarming news on Valentine’s Day! The second group of orangutans departed from Puruk Cahu at midday, around 11.55 AM, carrying Centil, Ross, Markisa, Uli, Manggo and Lupita. 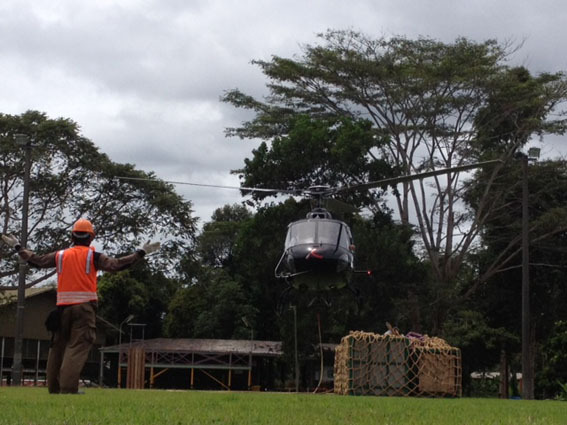 The helicopter landed in Batikap around 45 minutes later. As the team in Batikap took the second group of orangutans to their pre-designated release points, the pilot and co-pilot surveyed tomorrow’s release points to determine the best landing sites. 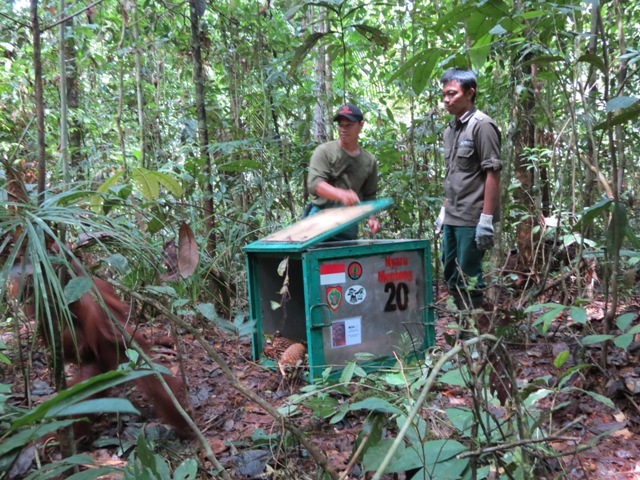 They arrived back in Puruk Cahu at around 2 PM, bringing empty travel cages and news that the rest of the orangutans were successfully released! So Edwan, Klowor, Rachmad, Darsi, Centil, Ross, Markisa, Uli, Manggo and Lupita are now home where they belong. Today’s successful release of 10 orangutans has been the best Valentine’s Day gift ever – for the orangutans and also for us – the gift of freedom! Tomorrow, we will continue presenting the gift of freedom to 10 more orangutans: Lesta & Lewis, Dagoy & Debby, Mogok, Isis, Mexa, James, Alibaba and Danur. 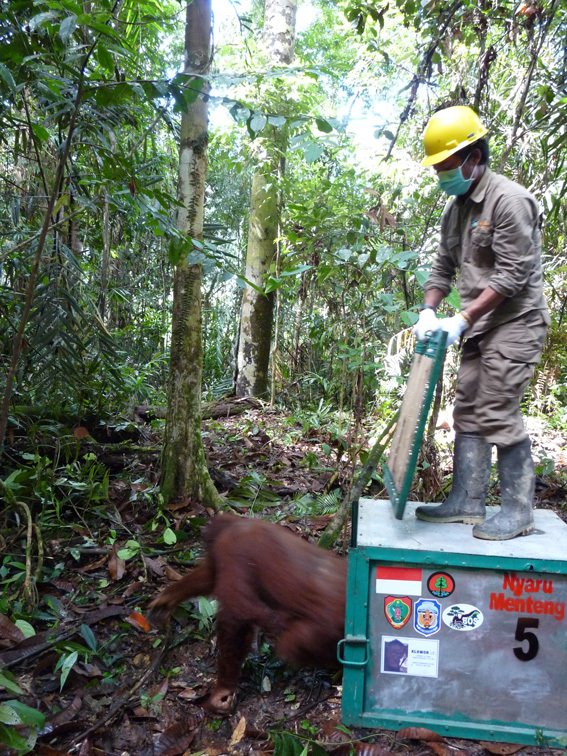 Log back in tomorrow for the final day of Nyaru Menteng 5th Orangutan Release! 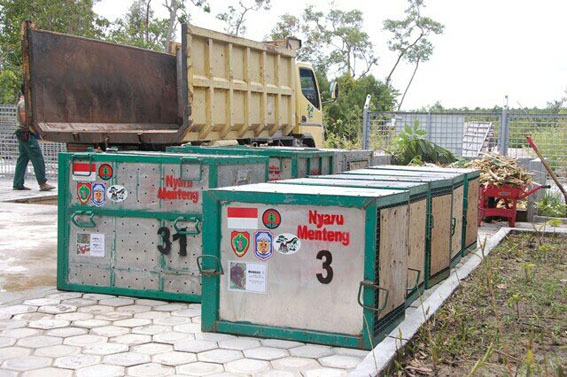 Starting today, February 13, 2013 and the next two days, February 14 – 15, 2013, five semi-wild orangutans and 15 rehabilitated orangutans finally left Nyaru Menteng and are heading to their pre-assigned release points at Bukit Batikap Conservation Forest. 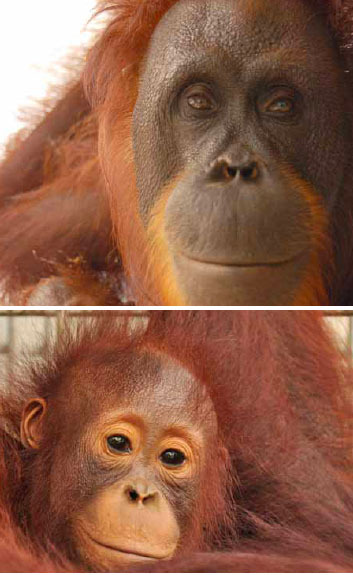 The five semi-wild orangutans consist of three males – Rachmad, Klowor and Edwan – and two females, Darsi and Mexa. While the 15 rehabilitated orangutans consist of four mom-child pairs – Lesta-Lewis, Dagoy-Debby, Markisa-Uli and Centil-Ross – as well as four males – Danur, James, Mogok and Alibaba – and three females, Isis, Manggo and Lupita. The good news is: this is the second time that the BOS Foundation releases “forest school graduates” or rehabilitated orangutans in Central Kalimantan. 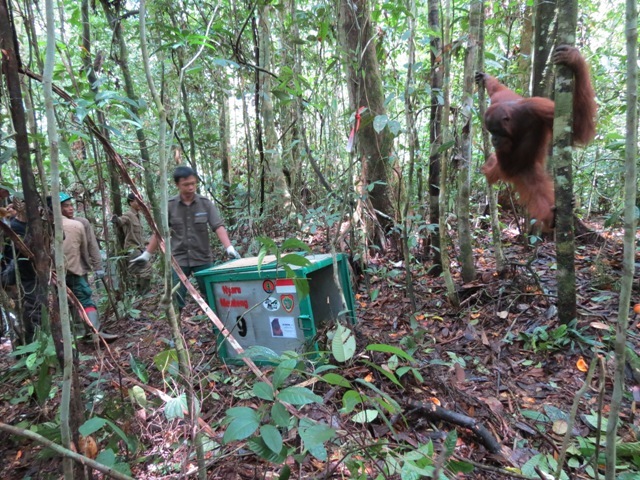 This is also the first out of a series of orangutan release activities scheduled in 2013. Towards the end of last year, these 20 orangutans were moved from the pre-release islands in Nyaru Menteng to the quarantine enclosure at a location called “Nyaru Menteng 3”, in order to undergo a series of thorough health checks. The next step was implanting transmitters so they can be monitored by the Post Release Monitoring (PRM) team for at least one year after they are released. This pre-release quarantine process takes at least 60 days to complete. 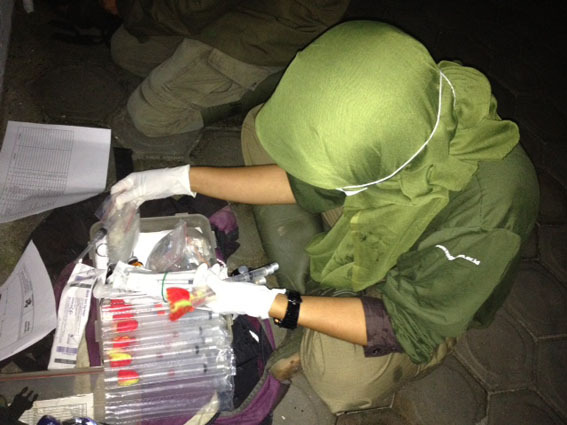 Today, February 13, 2013 at 5 AM, Nyaru Menteng Medical Team comprising veterinarians Agus Fahroni, Fiet Hayu P., Riani Anggun Mumpuni, Maryos V. Tandang, Meryl Yemima and Barlian Purnama Putra began the process of sedation for the first group of orangutans. They were Markisa-Uli, Manggo, Edwan, Darsi, Klowor, James, Centil-Ross and Rachmad. Markisa, however, did not have to be sedated. Carrying her daughter, Uli, she was simply guided by the technicians and willingly entered her travel cage. 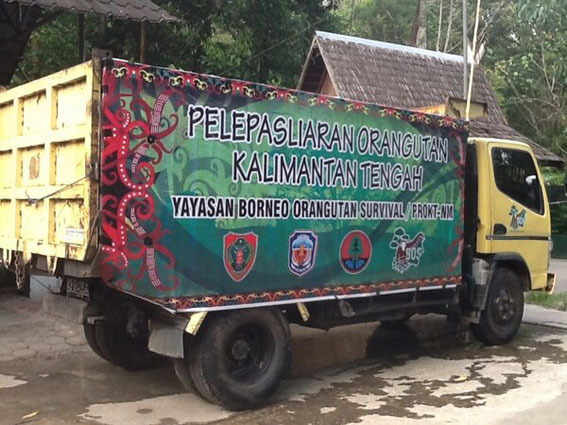 The first group was then loaded onto a truck and taken to Tjilik Riwut Airport in Palangka Raya, about an hour drive from Nyaru Menteng Orangutan Reintroduction Center. While travel cages of the first group were loaded onto the airplane, a press conference was held at Tjilik Riwut Airport to brief national and local media about today’s activity. Among the attendees were the Chief of Central Kalimantan Conservation and Natural Resources Authority (BKSDA), Ir. Kholid Indarto, and the CEO of the BOS Foundation, Dr. Jamartin Sihite. Then, it was time to take off. The first group of 10 orangutans departed from Palangka Raya at around 8.30 AM and landed safely in Puruk Cahu, the capital of Murung Raya Regency, at 9.30 AM. Welcomed by a team of technicians in Puruk Cahu, the travel cages were loaded onto a truck and immediately taken to our existing transit enclosure located in the compound of PT. Indo Muro Kencana (IMK). Due to the high number of orangutans to be released during this event, some of the orangutans will spend two nights here, before being transported by helicopter to their final destination, Bukit Batikap Conservation Forest. Meanwhile, back at Nyaru Menteng, sedation process for the second group started at the same time the airplane carrying the first group took off, which was at 8.30 AM. This group consisted of Alibaba, Mogok, Lesta-Lewis, Dagoy-Debby, Lupita, Mexa, Isis, and Danur. Just like Markisa, Lesta also did not have to be sedated. She and son Lewis cooperatively followed the technicians to their travel cage. And so did Isis. Upon arrival at Puruk Cahu at 2 PM, they, too, were taken to the transit area at IMK. And by 3.30 PM today, all 20 orangutans have all settled comfortably into each of the enclosures. In the next two days, they will again be divided into two groups. If all goes as planned and the weather is on our side, the first group will finally return home to the forest tomorrow, while the second group will get their turn the day after tomorrow. Stay tuned for more exciting updates of Nyaru Menteng 5th Orangutan Release! 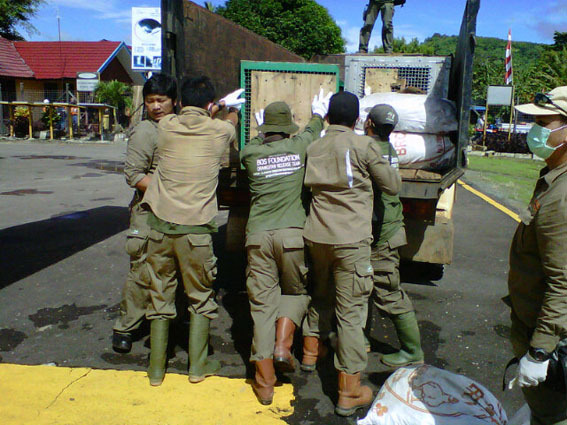 For live tweets (in Indonesian) of the entire process of Orangutan Release, follow our Twitter: @bornean_ou. Building on previous success in releasing 44 Central Kalimantan orangutans during 2012 and in commemoration of Valentine’s Day 2013, the Borneo Orangutan Survival (BOS) Foundation releases a further 20 orangutans from Nyaru Menteng as a tribute of love and dedication for the continuing conservation efforts of orangutans and their habitat. Nyaru Menteng, Central Kalimantan, February 13, 2013. 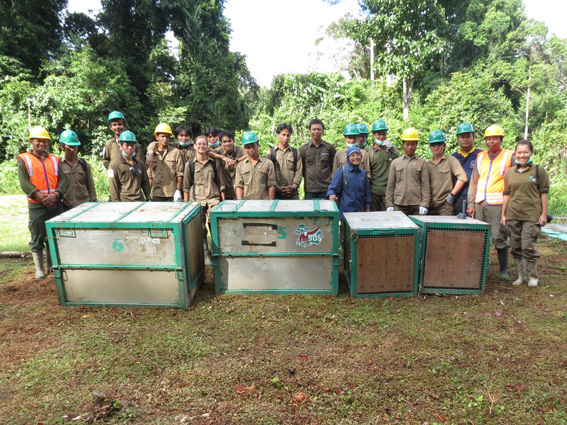 On February 13, 14, and 15, 2013, five semi-wild and 15 rehabilitated orangutans depart from the Central Kalimantan Orangutan Reintroduction Program at Nyaru Menteng to pre-selected release points in Bukit Batikap Conservation Forest. In addition to continuing last year’s release efforts and also observing Valentine’s Day, this forms part of the efforts to meet the targets of the Indonesian Orangutan Action Plan and Conservation Strategy 2007- 2017, launched by the president of the Republic of Indonesia during the Climate Change Conference in Bali, 2007, which states that all orangutans in rehabilitation centers should be released by 2015. During 2012, the BOS Foundation released 44 orangutans into Central Kalimantan and aims to release a further 80-100 orangutans here by the end of 2013, contributing to the effort to meet these targets. This is the BOS Foundation’s second release of wild born ex-captive rehabilitated orangutans in Central Kalimantan. Rehabilitated orangutans or rehabilitants are orangutans who were rescued at a very young age and/or had been kept by humans as pets. 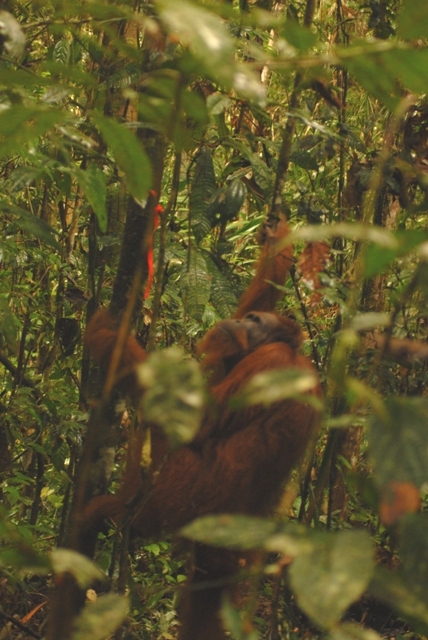 These orangutans did not have or had lost most of the necessary skills to survive independently in the forest and thus must go through an intensive rehabilitation process. All of the rehabilitants released during this activity have completed the entire rehabilitation process up to the pre-release phase on our pre-release islands, Kaja and Bangamat Islands. Due to the high number of orangutans to be released during this event, some of the orangutans will spend two nights within our existing transit enclosure located in the compound of PT. 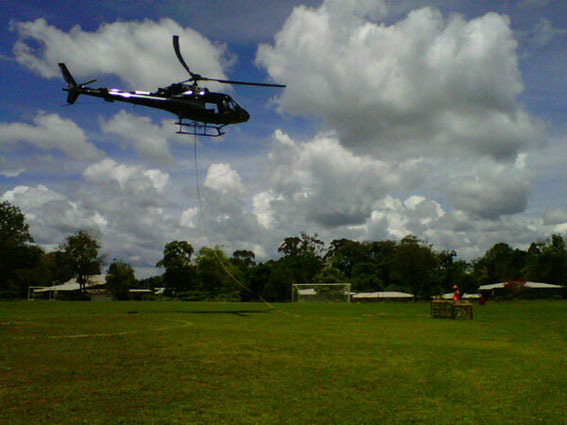 Indo Muro Kencana in Puruk Cahu before being transported by helicopter to Bukit Batikap Conservation Forest. 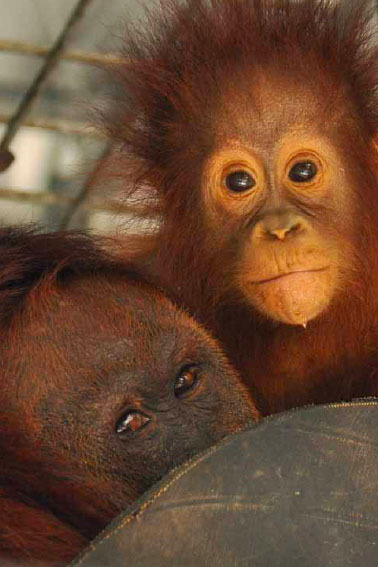 The success of orangutan conservation heavily relies on support from various parties, which include the government, society, and the private sector. Therefore the BOS Foundation, dedicated to the establishment and preservation of orangutans and their habitat, works with the government of Indonesia at all levels. At the provincial level, the BOS Foundation collaborates with the Provincial Government of Central Kalimantan as outlined in their Cooperation Agreement, effective since December 31, 2009, on orangutan and habitat conservation in Central Kalimantan. The current agreement also covers the working area of ​​the BOS Foundation throughout the Central Kalimantan province as a whole. The BOS Foundation is extremely grateful for the support given by concerned parties, including the Ministry of Forestry, the Provincial Government of Central Kalimantan, the Regency Government of Murung Raya, the Central Kalimantan Conservation and Natural Resources Authority, and the whole community of Murung Raya. This release is only possible with the moral and financial and logistical support from private sectors such as Indo Muro Kencana, together with our individual donors, institutional partners and conservation organizations across the globe who are concerned with orangutan conservation in Indonesia. On February 13, 14, and 15, 2013, five semi-wild and 15 rehabilitated orangutans depart from the Central Kalimantan Orangutan Reintroduction Program at Nyaru Menteng to pre-selected release points in Bukit Batikap Conservation Forest. 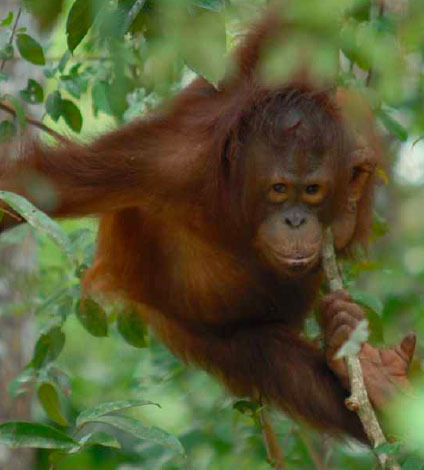 Semi-wilds are orangutans who have still retained their true nature at the time of rescue and have consistently showed that they have learned adequate forest skills. In November 2006, a team from the BOS Foundation and the Central Kalimantan Conservation and Natural Resource Authority (BKSDA) successfully rescued a young male orangutan who was separated from his mother in an oil palm plantation in Kotawaringin Timur Regency. Rachmad arrived at Nyaru Menteng on November 15, 2006. He was approximately 2.5 – 3 years old and weighed only 5 kg. Now a healthy 9 year old weighing 38.5 kg, Rachmad has grown into a strong orangutan with piercing eyes and long light brown hair. 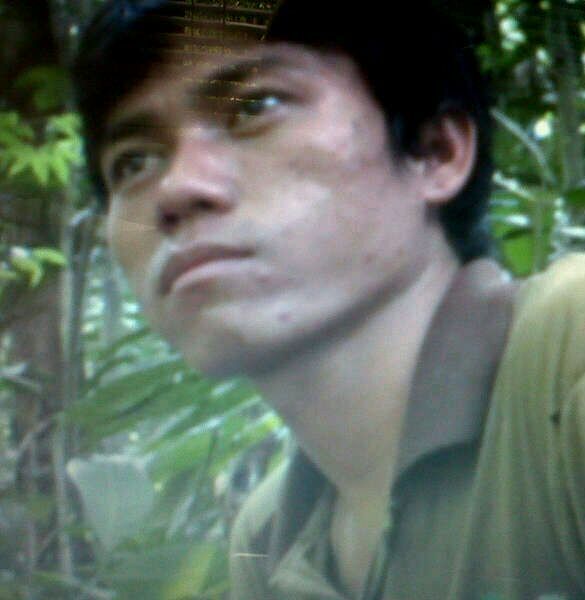 Soon, this handsome teenager will return to his true home in the beautiful conservation forest of Bukit Batikap. Mother-less, dirty, and looking miserable, a young female orangutan of approximately 4 – 4.5 years old was rescued from an oil palm plantation in Kotawaringin Timur Regency and brought to Nyaru Menteng on December 11, 2006. Her name is Darsi. Darsi is now 13 years old, weighs 47.8 kg, and has turned into a beautiful orangutan with long, thick dark brown hair and a dark face. 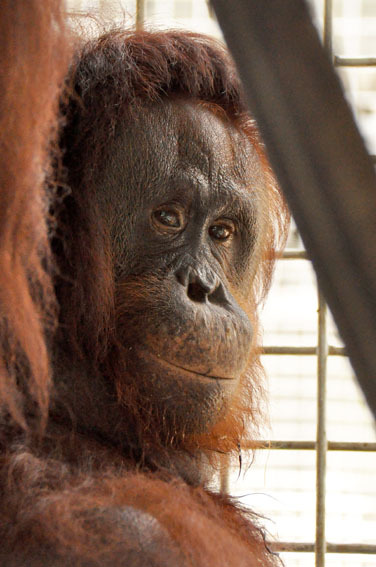 Six years in the rehabilitation center has given Darsi the chance to develop her independence as an orangutan. She makes kiss squeak sounds whenever she feels disturbed or when a human approaches her. Soon, Darsi will be truly independent when she and her friends are released into the conservation forest of Bukit Batikap. 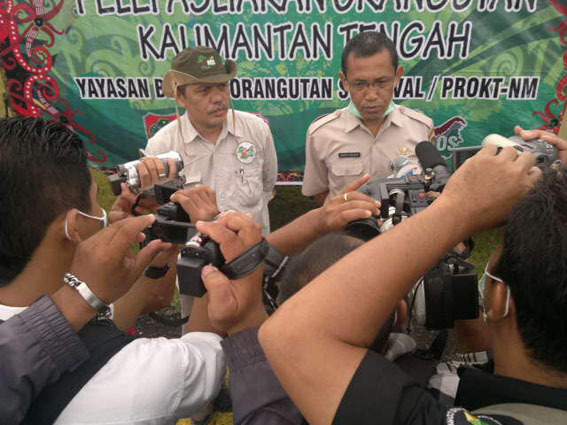 Mexa was consfiscated from an employee of an oil palm plantation in Kotawaringin Timur Regency. The female orangutan was found in a very disturbing condition restrained by a chain secured around her neck. Arriving at Nyaru Menteng on August 6, 2006, she weighed 31 kg and was estimated to be around 15 years old. When she first arrived, the scar from being chained was still clearly visible on her neck. However, Mexa still possessed her wild nature and never once showed dependency on humans. Nevertheless, due to her poor condition, she had to be quarantined for a while to undergo intensive treatment. Now Mexa is 22 years old and weighs 43 kg with long hair and black skin. She remains to be a wild and active orangutan. Even in an enclosure, Mexa makes kiss squeak sounds and moves around agitatedly whenever someone approaches her enclosure, indicating that she is not happy to see humans around. 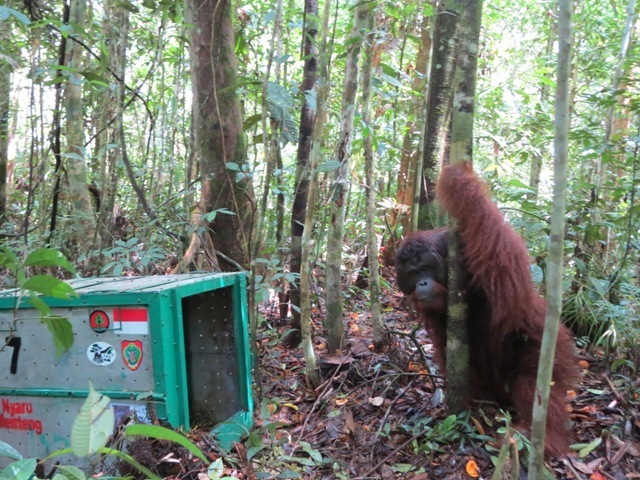 Mexa is counting the days until she is released in the forest! Klowor was consfiscated from a resident of Pundu Village on February 20, 2005. This young male orangutan was approximately 3 – 3.5 years old when he first arrived at Nyaru Menteng. Klowor is an active orangutan! Whenever he hears his orangutan friends pounding their enclosures, he will do the same, pounding his enclosure. He also loves to teasingly poke any technician cleaning his enclosure. Distinctive large front teeth, thin hair and beard, Klowor is easily recognised by the technicians. After seven fun years at the rehabilitation center, 11 year-old Klowor now weighs 37.1 kg and is ready to return home to the real forest! Rescued from an oil palm plantation in Antang Kalang Village in Kotawaringin Timur Regency, this young male orangutan of 4 – 4.5 years old still retained his wild nature. He was taken to Nyaru Menteng on August 27, 2007 and was named Edwan. Edwan is now 9 years old and weighs 32 kg. 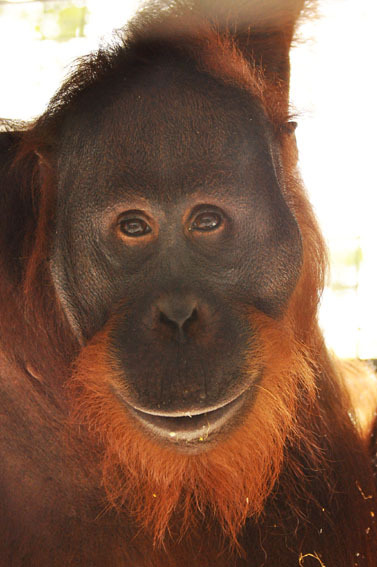 The short-haired teenager has become a handsome, independent and active orangutan. Together with some of his friends, he will soon be able to reclaim his righful freedom in Bukit Batikap Conservation Forest. Rehabilitants are orangutans who were rescued at a very young age and/or had been kept by humans as pets. These orangutans did not have or had lost most of the necessary skills to survive independently in the forest and thus must go through an intensive rehabilitation process (Forest School and the final pre-release stage on an island/halfway forest), which can take up to 7 years on average. 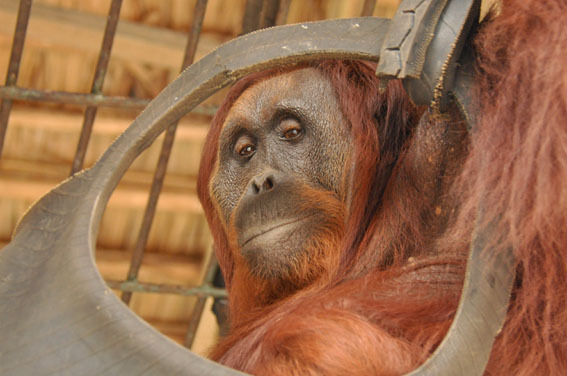 Lesta is a female orangutan who was confiscated from a resident of Palangka Raya on December 17, 1999. 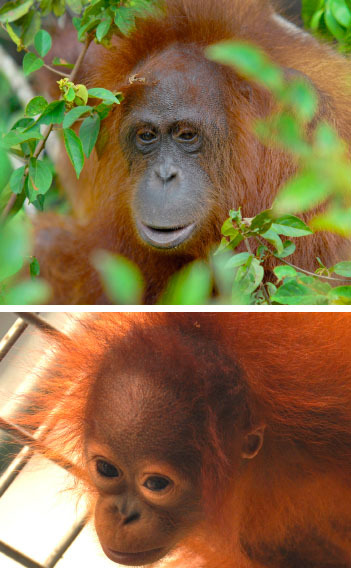 When she first arrived at Nyaru Menteng Lesta was approximately 4 – 4.5 years old and weighed 12 kg. Living on Kaja Island, one of the pre-release Islands, Lesta is not dominant, but among other females she is socially at the top of the hierarchy and has a lot of experience. Her extensive travel range when exploring the island has made many male orangutans on the island become attracted to her. After almost 13 years living in the rehabilitation center, Lesta who is now 18 years old has delivered three babies. One of them is Lewis, her third offspring born on Kaja Island on March 16, 2011. One year old Lewis still spends his days in his mother’s arms and Lesta is often seen feeding him with fruits. Both of them are waiting for the day when they will make their final homecoming trip together to the forest of Bukit Batikap. Dagoy is a female orangutan who was confiscated from a resident of Kasongan, Katingan Regency. When she arrived at Nyaru Menteng on March 8, 2000, Dagoy was approximately 12 years old. Together with other orangutans her age, Dagoy lived within one of our socialisation enclosures. Two years later in February 2002, she was moved to Kaja Island, which is the last phase of our orangutan rehabilitation process. The beautiful and independent Dagoy is now 24 years old and weighs 38.8 kg. She is a dominant orangutan among other females. With her dark brown hair and a bone growth on her left shoulder that she’s had since birth, Dagoy can easily be recognised by the technicians. In August 2004, Dagoy delivered her first son, Terusan. She then gave birth to daughter Debby, her second baby on July 16, 2009. Dagoy and Debby will soon join Terusan who was released back in early November 2012 in Bukit Batikap Conservation Forest. We will watch with interest to see if Terusan interacts with his Mum in the forest! Markisa, then only 4 years old, arrived at Nyaru Menteng on November 20, 2000, after being confiscated from a resident of Palangka Raya. After 12 years living in the rehabilitation center, Markisa has delivered two babies on Kaja Island. Both are baby girls; her elder daughter, Manggo, is already an independent orangutan, while one year-old Uli is still always in Markisa’s loving arms. Even though she grew up in the rehabilitation center, Markisa is a good mother to her infants. 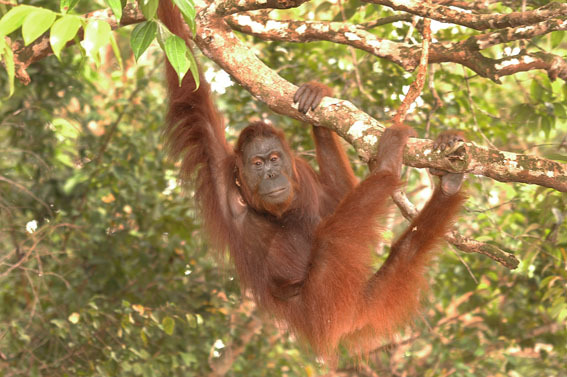 She is also well-known for being an active orangutan who loves to explore the forest, indicating that Markisa is ready to live in a real forest. She is now 17 years old with dark brown hair and weighs 38.9 kg. Markisa and her two beloved daughters, Manggo and Uli, are ready to make a final journey to their new home, Bukit Batikap Conservation Forest. 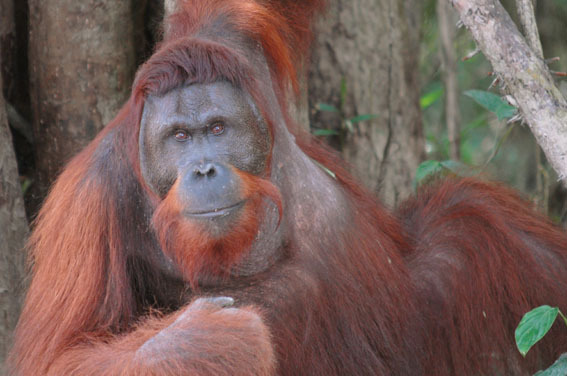 On February 26, 2002, a female orangutan named Centil from Pontianak, West Kalimantan arrived in Palangka Raya. Confiscated by the West Kalimantan Conservation and Natural Resources Authority (BKSDA) she was estimated to be 6 – 6.5 years old. Health check results showed that Centil was healthy, thus she could immediately commence the rehabilitation process at Nyaru Menteng. On October 10, 2005, Centil who has long dark brown hair and dark face was moved to Bangamat Island. She is an active orangutan who loves exploring the forest and playing by the river. 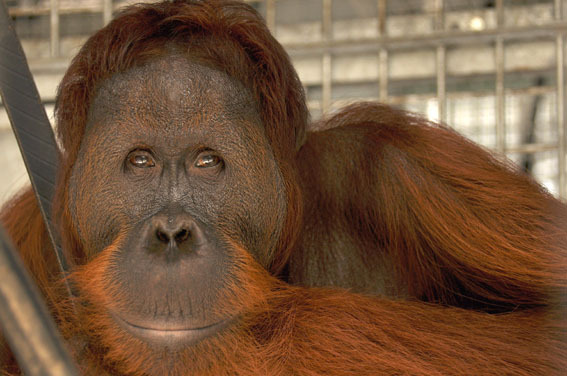 On November 27, 2009, Centil delivered her second baby, a female orangutan named Ross. Before that, Centil had had a son, Edwin. Unfortunately Edwin died from illness. Learning from that bitter experience, Centil is now very protective over her daughter and is often seen lovingly sharing her food with her. Centil is now 17 years old, weighs 32.9 kg. Together with Ross, they are soon going home! 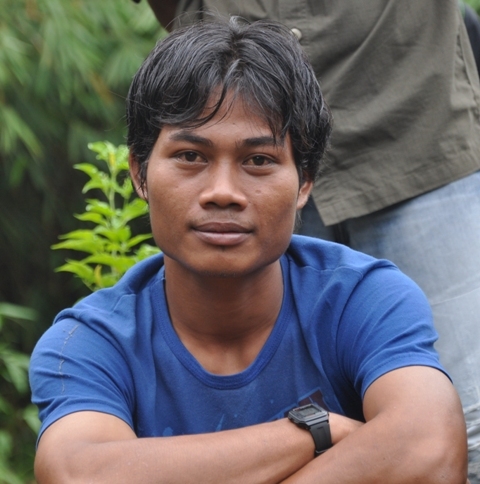 Danur was confiscated from a resident of Palangka Raya when he was 4 – 4.5 years old and weighed 17 kg. 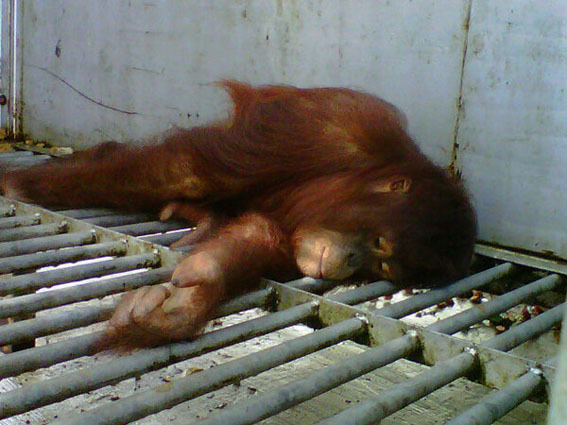 On August 23, 2000 he arrived at Nyaru Menteng to undergo intensive care and rehabilitation. 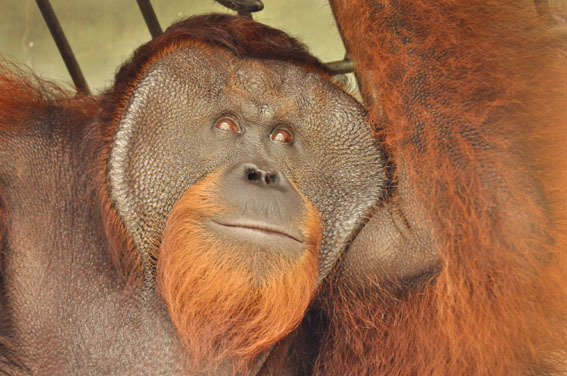 At 17 years of age, Danur is a big adult male who weighs 82.2 kg. His sheer size is probably the main reason for his dominance. Not only that, Danur is also keen on playing in the water! He often plays in the shallow part of the river. This is a very unique fact as many studies show that orangutans don’t like the water very much. However, Danur proves otherwise. 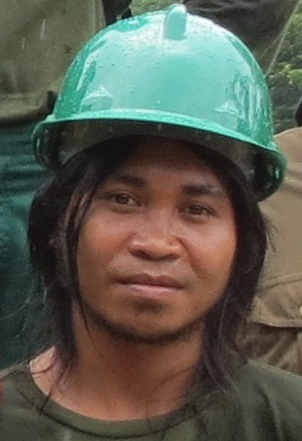 Danur’s determination to “release himself” from Bangamat Island places him as a top candidate for reintroduction into Bukit Batikap Conservation Forest. After being confiscated from a resident of Palangka Raya on February 8, 2003, Isis who was approximately 6.5 – 7 years old and weighed 34 kg immediately entered our rehabilitation facility at Nyaru Menteng. Isis is now 16 years old and weighs 45.4 kg. This female orangutan with a tall posture is very smart and creative! Her favorite activity is to take flight from the pre-release Island using a pole to navigate her way across the water. She can soon have as many adventures as as she likes when she returns to her true home in the wilderness of Bukit Batikap! 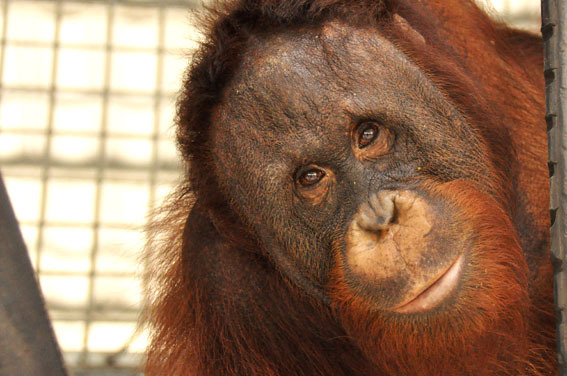 Manggo is Markisa’s first daughter, born on Kaja Island on June 9, 2005. Naturally, she has adapted to life in the forest of Kaja Island which she learned from the best teacher, her own mother. Manggo has mastered the skills to build nests, recognise natural predators, and forage for food. In addition, her great curiousity prompts her to always actively explore the forest on Kaja Island. She is now a beautiful teenager at 7 years of age, weighs 29.7 kg, and has long, thick bright brown hair. 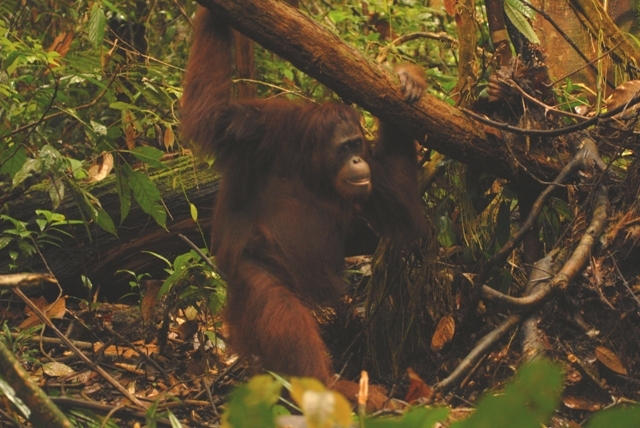 While she is not a dominant orangutan, her forest skills prove that she is ready to embrace true freedom in the conservation forest of Bukit Batikap. 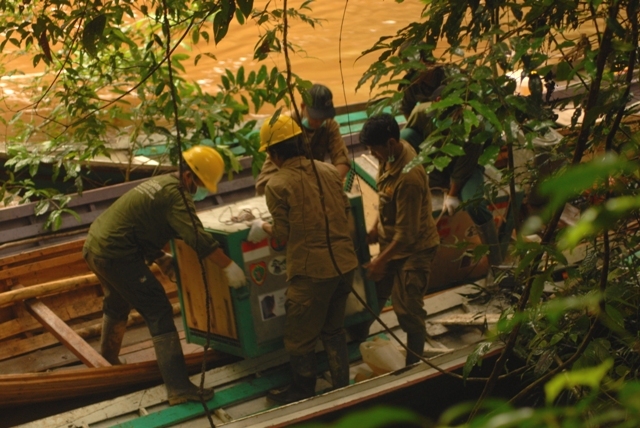 James was confiscated by the Central Kalimantan Conservation and Natural Resources Authority (BKSDA) from a resident of Sampit, Kotawaringin Timur Regency on August 1, 2004. He was 5 – 5.5 years old. Since then, he has been living at Nyaru Menteng. 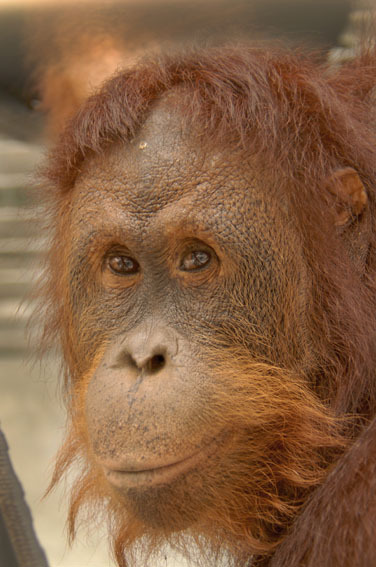 He is now 14 years old and weighs 76 kg, a dashing orangutan with wide cheekpads that make him look very gallant. In the rehabilitation center James is quite friendly towards the technicians. Once in a while he playfully pokes the technicians cleaning or passing by his enclosure. Even so, he has started to exhibit signs of dominancy. James is active and whenever he feels disturbed, he will make loud kiss squeak sounds while swinging and spinning on the rubber ropes in his enclosure. Soon James will be released. Even though we feel sad to part with him, we find comfort in knowing that James will be able to live as his dominant self in his own territory in Bukit Batikap Conservation Forest. Mogok is a male orangutan who was confiscated from a villager of Buntut Bali in Katingan Regency. He arrived at Nyaru Menteng on December 6, 2002 and was estimated to be 2 – 2.5 years old. Mogok is now a young adult of 13 years old and weighs 49.3 kg. The brown-haired lad has started to grow a mustache and beautiful cheekpads. He looks very handsome! He is also a remarkable explorer. During his time on Palas Island he is often seen exploring and eating wild fruits together with a female orangutan named Bonita. Mogok has graduated from the pre-release island and is ready to move to his real home in Bukit Batikap Conservation Forest. Alibaba had been living as a pet of a resident of Tumbang Samba Village, Katingan Regency for a few months before being finally rescued. 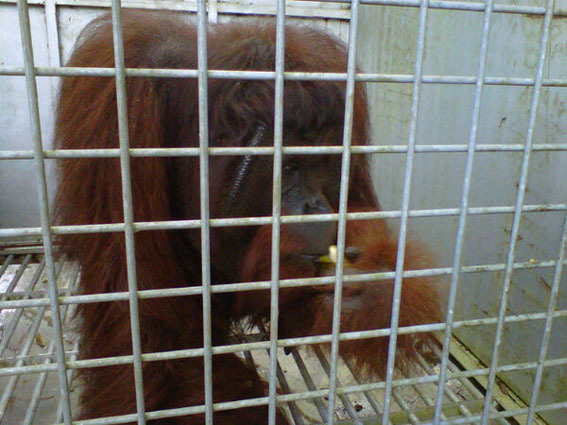 The 2 year-old male orangutan was found in an upsetting condition with the tip of his left ring finger dismembered. After 10 years at the rehabilitation center, Alibaba is now an independent, tough young man, who no longer feels comfortable around humans. Now 12 years old, at 50 kg, he looks very handsome with bright brown hair and a tiny crest of hair on his head. 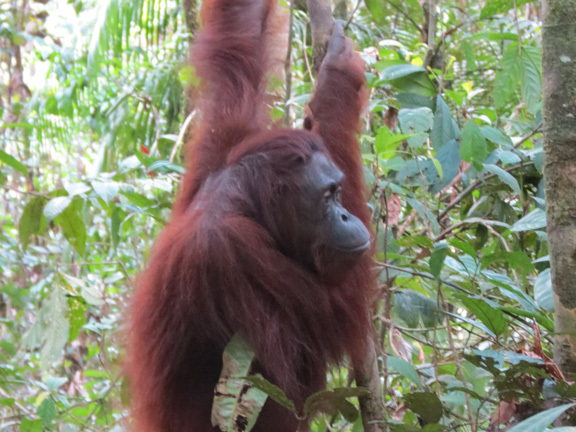 Soon it will be homecoming time for Alibaba as he journeys to the natural rainforest of Bukit Batikap. 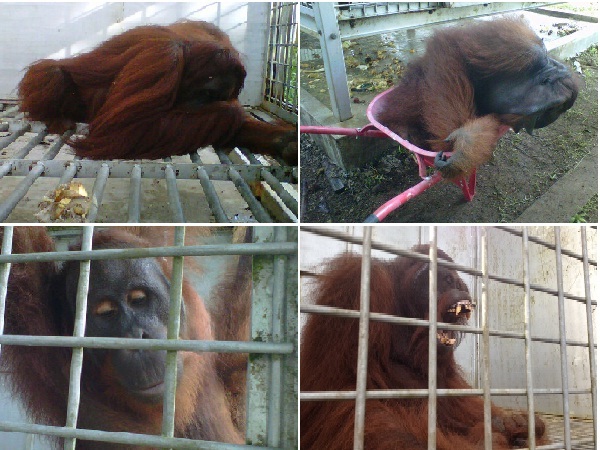 After two weeks of being held captive by a resident of Buntok, South Barito Regency, on October 5, 2003, Lupita, a female orangutan of 3.5 – 4 years of age was confiscated and taken to Nyaru Menteng. 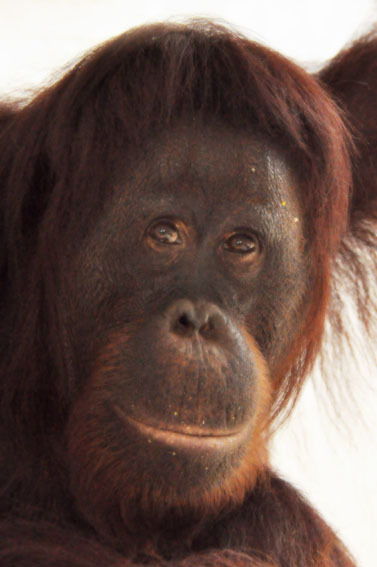 Nine years living in the rehabilitation center, the gorgeous Lupita has long thick hair and an oval face She is known as an active and sociable forest explorer. 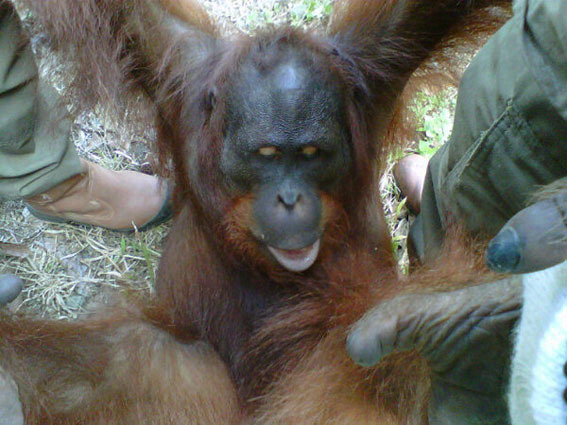 Now at 13 years old, weighing 26.4 kg, she will regain her true freedom as an orangutan, in Bukit Batikap.